KINOMOTO Sakura puts on her Tomoeda Junior High School uniform for her first day as a first year student. After the usual teasing by her college age brother Touya, she races off to school, enjoying the view of the sakura blossoms, but missing Syaoran. To her delight, she encounters Syaoran, wearing the male version of her school’s uniform and holding the teddy bear she’d given him when he’d returned to Hong Kong. She races into his arms, both happy to be reunited, but then Sakura realizes they are being recorded by her best friend Tomoya. Syaoran does seem a little put out when Sakura and Tomoya race on to school ahead of him. After school, Sakura uses her smart phone to call Eriol in England, to report about Syaoran’s return, though he’s not in her class. She is with Naoko and Yamazaki, but her friends Tomoyo and Chiharu are in another class as well. And Rika is in another school. Mizuki-sensei says hello to Sakura before returning the phone to Eriol. After Sakura finishes her conversation, Kero-chan celebrates a video game achievement. The next afternoon, Syaoran walks Sakura home, even though he lives in the same apartment as before, which is in the other direction. They talk about the bears they made for each other, then decide to exchange bears again to allow their creators time with their creations. Touya returns home with a present for Sakura from Yuki. It is a wing-shaped broach with a star attached. Sakura takes out her star-key pendant, which she hasn’t transformed into its magic girl staff form in quite some time. She puts the two items into a treasure box, next to her book of Sakura Cards. That night, Sakura has her first dream in a while, where she sees a bunch of transparent cards, and some being hidden in clothing. When Sakura wakes up, she races to her Sakura Card book that contains her cards and makes a discovery. 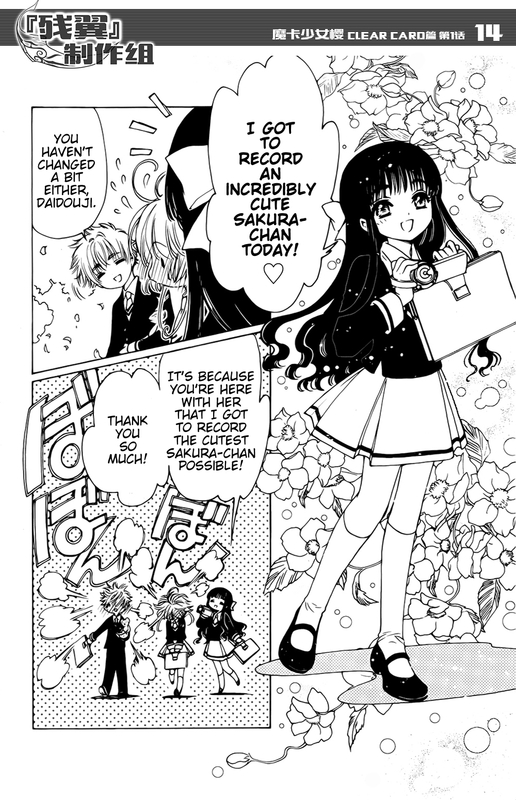 I like that this first chapter picks up shortly after the Cardcaptor Sakura series ended. Basically, CLAMP just uses this first chapter to reintroduce us to the main and supporting characters from Cardcaptor Sakura and set the table for the adventure(s) to come. With Rika being put into another school, I guess we won’t see much of her. If that’s true, it will be a convenient way for CLAMP to avoid discussing that sticky relationship that Rika had with their homeroom teacher in elementary school. One of the things about Cardcaptor Sakura is an underlying theme of the manga was as long as there’s love involved, there’s no such thing as a wrong relationship, including illegal relationships. While Cardcaptor Sakura was set in the mid-90s, Cardcaptor Sakura Clear Card Arc doesn’t know where it is set. I’m laughing because on one hand, Tomoyo-chan has her iconic video camera at the ready, which was quite high tech and expensive in the 90s. On the other hand, Sakura and Eriol are using smart phones, which did not exist in the 90s. Go figure. It is almost weird not seeing Sakura wearing skates to get to school in the morning. I guess this is a way for CLAMP to show she’s gotten a bit older now. 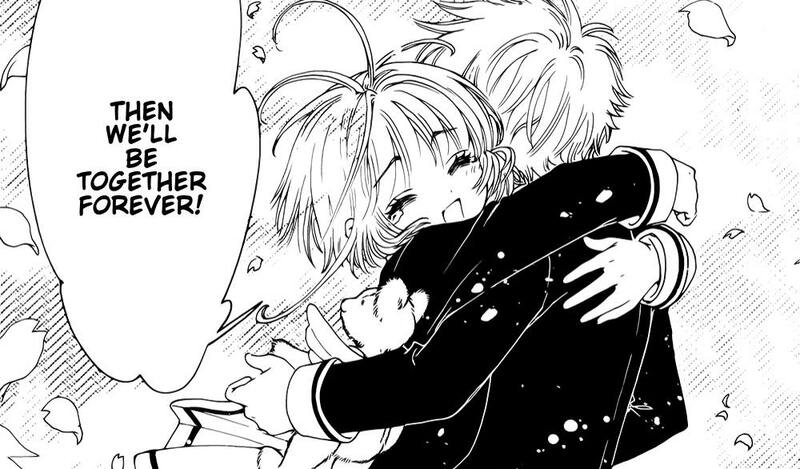 Having reunited our young lovers (Sakura and Syaoran) and having connected us with the other characters, CLAMP gets us to whatever “shocking” discover Sakura makes about her cards. I’m thinking, “If CLAMP treads out the ‘Eriol is forcing you to grow as a mage by making you collect the transparent versions of your cards’ plot element, I’m not going to be happy.” But, it is too early to just to any conclusions. I just don’t trust CLAMP. In the end, Cardcaptor Sakura Clear Card Arc 01 gave me a warm, fuzzy feeling (Hoeeeee!) in spite of this being CLAMP returning yet again to an old work of theirs. So, Clamp are releasing new CCS chapters 16 years after the original’s conclusion, but X is still unfinished, with no new chapters in the past 13 years. They also halted Legal Drug, brought it back after an 8-year hiatus, then halted it again. What exactly are their priorities as mangaka? Do they even have concrete goals anymore, or are they just winging it, producing whatever fits their fancy but then dropping it “for reasons” like some fanfic authors that decided to leave a popular story unfinished but then started something else? Clamp were once one of my favorites many years ago, but their lack of commitment in the past decade-plus has really turned me off to them. Do they even have concrete goals anymore, or are they just winging it, producing whatever fits their fancy but then dropping it “for reasons” like some fanfic authors that decided to leave a popular story unfinished but then started something else? Heh! My own feeling has been the winging it option. Hmm, I loved Card Captor Sakura so much that I think I can’t read this until it’s done lest it go the way of Tsubasa. After reading this entry, I was going to jump all over “Clear Card Arc 01,” but not after the subsequent reading about Clamp’s hiatuses. I want to trust my authors to have some consistency and continuity. Apparently I can’t with these four sensei. I will get the new manga for this when it becomes available commercially but at this point I think CLAMP have turned into a bunch of sick trolls. CCS was one of their best structured stories with a definitive ending and since the manga is a direct continuation I fear their just going to put it on hiatus for the hell of it. I’m being a little sarcastic but the reason I stopped buying the CLAMP brand after the conclusions to Kobato, Tsubasa, and xxxHolic is because all their new stuff are reboots and continuations of older stories that still have no end in sight. I miss the days of RG Veda, X (despite the non-ending), Chobits, Angelic Layer and various works where things weren’t dragged out into over convoluted plots or just never touched upon again. X was understandable because of the controversy and I understood the main artist suffered from an injury she has yet to recover from. It just seems like X kicked off a lot of their darker works not to have any closure and the Tsubasa/xxxHolic mess led to underwhelming storytelling. I think CLAMP have turned into a bunch of sick trolls. Ha!ha!ha! I hadn’t thought of them in those exact terms, but you are right. So yeah, CLAMP has been up and down, with a massive side of hiatus titles. I should be more specific. The series I listed I didn’t have a personal attachment to, I was using them as examples of a time when CLAMP would follow through on a body of work to completion. My personal CLAMP favorites are Tokyo Babylon/X, Magic Knight Rayearth, Chobits, Card Captor Sakura and Tsubasa/xxxHolic (before their narrative issues set in). Angelic Layer I’ll always prefer the anime version since the characters felt more “real” there and I felt the story developed more organically (let’s just say a certain character’s Mom had a more compelling story, kind of similar to Tenchi’s Universe vs. OAV mom). I agree there, which is why the manga was so disappointing to me. It is another rare instance of an anime adaptation trumping the source manga. Hey, I was just wondering where you found the manga scans? Thanks for posing his regardless! I think the one I saw was on Reddit or maybe that linked to something on 4chan (don’t have a link). I’m guessing the ones with the incorrect translation of “university” as “high school” for Touya is on one of the online aggregate sites.